Two DVDs or One Blu-ray Disc Specify in Shopping Cart. 126 minutes. 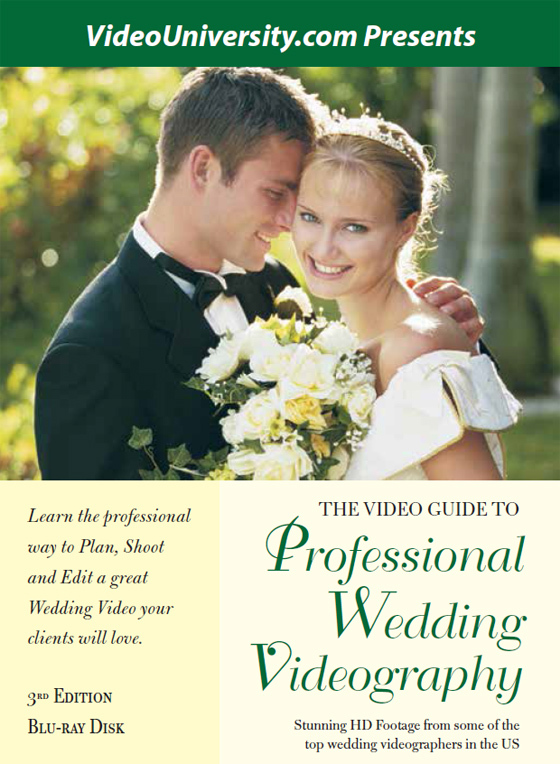 Get the Video Guide (DVDs or Blu-ray) and the book, Wedding Video for Profit, and save! The Video Guide to Professional Wedding Videography described above. Watch how to shoot and edit an entertaining, fast-paced, $1700 plus wedding film on weekends. You’ll get thorough instruction with stunning HD examples from some of the top wedding videographers in the U.S. This new 10-part HD video guide is perfect for those just starting out in the exciting wedding video business. If you’ve already done 4 or 5 complete videos for weddings, this video is probably not for you. This video shows step-by-step how to plan, shoot, and edit a professional wedding video. Also includes 4 beautiful bonus videos from professional wedding videographers. Here’s a 30 second version of the 2 hour video. Discover the essential gear you need and learn the most important features of a digital video camera for wedding work. Discover the pros and cons of DSLRs and learn the best time to acquire them. A lot of great videos have been made with only basic equipment, but there are some corners you cannot cut. You’ll learn to bootstrap your equipment inventory gradually as your business grows. Since video equipment becomes obsolete quickly, see how to plan your purchases carefully to maximize the useable life of your equipment. Audio is a very important part of your work. Some say it’s more important than the visuals. The video demonstrates professional audio techniques with examples from real weddings. You’ll get seven pro tips to prevent the most common audio problems. Discover the best micing techniques for different types of wedding scenes. Learn how and how not to work with a church sound system. Great sound makes such a difference because the audio track is the one of the most emotional elements of a wedding. Learn how to plan the best camera and mic placements for the ceremony. Discover the one wedding document that is invaluable in planning any video. Planning helps avoid having your view of the bride and groom blocked. Learn the two potential obstacles that you will not see until the wedding and what to do about them. Master the five critical steps for covering the ceremony. This video insures your success before you shoot. Successful wedding films don’t just happen. They are planned. Discover some great ways to begin the story of a wedding including techniques for shooting and editing the preparations and other unstructured parts of the wedding day documentary style. See how a simple shot can make a powerful ending for your video. Learn the best techniques and strategies for shooting the three main elements of most weddings – preparations, ceremony, and reception. See the “must have” shots that your clients expect to see. See when to use a handheld camera and when not to. Get important advice on lighting the reception. See how to cover the ceremony with one or two cameras. For two-camera coverage, see what each camera must cover and how to make it easy to edit. Watch how to shoot a conservative Jewish wedding. Get the five keys to successful wedding ceremony shoots. Master the single technique that captures the emotions of the day far better than anything else. Editing is where you can make or break your production, so we’ll offer concrete suggestions on how to structure your story and keep the pace exciting. You’ll learn how to create a consistent tapeless workflow and backup procedure that is fast, efficient, and secure. This is very good for your business. Today delivering the finished product is more than just DVDs. See what other wedding videographers give their clients. See how to make an attractive case or presentation that actually promotes your business. Using unlicensed music these days can get you in a lot trouble as some have learned the hard way. We’ll share the best music libraries for wedding films that clients love. After you’ve mastered the basics of documentary wedding video, you can explore the artistic “Cinematic” style which requires more expertise and equipment. They look more like romantic music videos. You’ll see some great examples, and learn what not to do. Learn how to produce a fast-paced highlight which will delight your clients. You’ll begin to develop your own style which is fun and satisfying. Clients love to post their highlight videos on social media which is great for you. There’s no better way to promote your business. Many of the examples in this video may bring a tear to the eye. But don’t forget – whether documentary, cinematic or somewhere in between, wedding videography is first and foremost the story of two people joining their lives in front of friends and family. Discover an easy way to capture the important people like grandparents and other family members. They won’t be around forever. These shots will be quite meaningful to your clients. Discover the many “add-ons” you can offer your client for additional profits. You’ll want to offer some of these profitable “add-ons” immediately. “I just had my first solo wedding a week ago. To succeed in the business side of wedding videography you’ll also want to read our companion book “Wedding Video For Profit.” It’s all about the business and marketing aspects of wedding videography. When you buy both the book and the video, you’re building a very solid foundation for your business success. Get ’em both and save!